This internationally acclaimed textbook provides a comprehensive introduction to the modern study of computer algorithms. It covers a broad range of algorithms in depth, yet makes their design and analysis accessible to all levels of readers. Each chapter is relatively self-contained and presents an algorithm, a design technique, an application area, or a related topic. The algorithms are described and designed in a manner to be readable by anyone who has done a little programming. The explanations have been kept elementary without sacrificing depth of coverage or mathematical rigor. The third edition has been revised and updated throughout. It includes two completely new chapters, on van Emde Boas trees and multithreaded algorithms, and substantial additions to the chapter on recurrences (now called Divide-and-Conquer ). It features improved treatment of dynamic programming and greedy algorithms and a new notion of edge-based flow in the material on flow networks. Many new exercises and problems have been added in this edition. 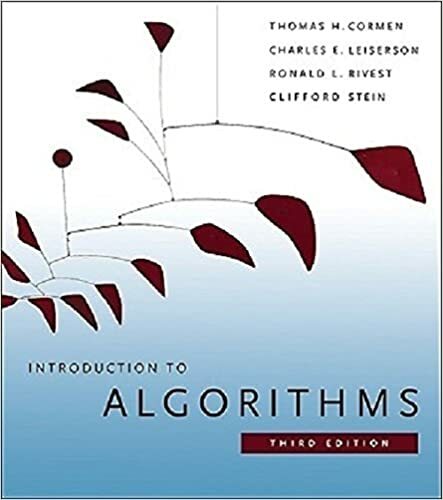 The text is intended primarily for students studying algorithms or data structures. As it discusses engineering issues in algorithm design, as well as mathematical aspects, it is equally well suited for self-study by technical professionals.